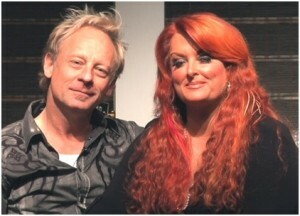 Cactus Moser and special guest Wynonna appeared on The Producer’s Chair, Thursday, April 9, 2015 at Douglas Corner at 6 p.m. The charismatic driving force behind Highway 101, Cactus Moser is one of the most multi-talented drummers to ever hit the Row—not to mention one of the most passionate. Astonishingly, Cactus was back on tour playing drums with wife Wynonna three months to the day after the horrific 2012 motorcycle accident that took his left leg and almost destroyed his left hand. His pace has not slowed since. Prior to forming Highway 101 with Paulette Carlson, Curtis Stone and Jack Daniels, Moser was a full-time session player in L.A., who honed his producer chops following a 9-week course in music engineering. Propelled by his love for all things music, Cactus started writing songs and soon got his first publishing deal with Warner Bros., which lasted five years. Then he signed with Sony Tree for another five, garnering about 20 cuts per deal, not including the songs he wrote and produced for Highway. Warner Bros. signed the band to their first record deal in 1987 and released four albums over the next seven years. They entered a new deal with Liberty under Jimmy Bowen in 1993 and then with Intersound Records in 1996 and FreeFalls records in 2000. In all, the band had 16 consecutive top 10 singles, four of which went No. 1. Highway won the award for Vocal Group of the Year at the 1987 and 1988 CMA Awards. Today, Moser is a producer, engineer, musical arranger, multi-instrumentalist, singer and actor, who has appeared in 11 films and documentaries. He he has scored several soundtracks for TV and film. Not bad for a cowboy from Colorado. Inspired by a local band, Cactus started playing guitar at age 9. The next year his parents left their struggling cattle ranch and moved to Denver. Cactus went to live with his grandmother and started playing drums. “That year for my birthday, I got a tiny Japanese drum set,” explained Moser. “As soon as I had enough practice under my belt, I joined a band. I also started playing in the stage band at school and the school orchestra. “When I was 19, I played my first session. It was in Boulder at Northstar studio for a session being produced by Chris Hillman from The Burritto Brothers and The Byrds. Chris was married to one of Elton John’s managers. That led to going to L.A. Fast-forward I wound up playing on a ton of things and touring. I eventually went back to Bolder and put a band together and we were offered two deals. “We chose Asylum right before Black Friday, which was when all the labels got gutted. We probably should have signed with Michael Nesmith, who had the other record company. He told us he was going to do these things called videos for this thing called MTV. We thought he was nuts. Producer’s Chair: When did it hit you that you wanted to be a producer? During that period we were playing on records by Amy Grant, Phil Keaggy and Twila Paris’s classic recording “The Warrior is a Child,” thanks to our Steve Taylor connection. In Highway, I learned a lot from Paul Worley. We were at Sound Emporium and he was the first one to say, “Don’t think this is a session. Just be a band…bring it.” He had a lot of impact with that one comment. We already had a hit with “The Bed You Made for Me.” We recorded that in L.A. then we came down here and I saw the creativity of that environment. I started watching how Paul worked and how he thought—focusing on what we did naturally. When did you move to Nashville? We decided to separate with our first lead singer Paulette Carlson, so Worley and Martha Sharp (A&R at Warner) said it would be a lot easier to move forward with the new singer and the label, if I moved to Nashville. I was already spending a lot of time here writing songs because I saw that’s how you make money. I had a single or two by then and wanted to keep that up so, as much as I loved L.A., I made the jump in 1991. Tell me about your writing. Did you have a publishing deal? I got a publishing deal with Warner down here because of the band signing. I had a few outside cuts, but mostly wrote for the band’s records with Curtis and Paula. Then Worley became the head of Tree. So after five years with Warner, I signed at Tree for five years and got into the whole walking into a room, pulling down your pants and writing with strangers. We were producing a lot of demos. I had Pam Tillis as one of my demo singers. That’s where you learn how to cut five songs in three hours. When you moved, were you strictly focusing on Highway or were you also doing session work for other people? All of the above. There was some resistance because I had my face on the record and they didn’t think I [had the skills] to be a session guy too. In those days, guys in bands didn’t play on their own records, so the fact that we did was kind-of off the grid. With producing, you just had to make your own way. Highway’s career was settling due to record company politics. So I started venturing into other musical landscapes–writing edgy modern rock in the ‘90s and started going back to L.A. I sort-of dropped off the map because I felt very burnt. I got into a funk about this town and turned down some cool production gigs because I wanted to break ties. So I started writing with signed rock guys to re-energize myself to like music again, because I got to the point where the business was all I thought about. Was it session work or production that you wanted to get back to? I wrote seven of the 10 and I co-produced with Chuck [Howard]. It was finally our chance to re-establish Highway. Jimmy wanted to spend the money, and we were both proud of the project. We had the record release party at my ranch. TNN and CMT were there, and the only person missing was Jimmy because he wasn’t feeling well. He ended up having a quadruple bypass and deciding to quit the business. There went deal number two, because the new guys coming in didn’t care about who was already there. That is where my funk began. I remember sitting in a diner on the east coast with Curtis and Nikki, our fresh new singer. I said, ‘I’m going to be honest, I want to do something else before I’m too old. I don’t like this music anymore and I don’t like this game.’ Curtis was kind of the same and Nikki wanted to keep going. In hindsight, we should have gone to Tony Brown at Universal or somebody and shopped the record around. Instead we quit. So that’s when I went into that darkness and spent some real hard years, trying to figure out what to do. After Liberty, the band signed to Intersound. How did that come about? The original singer Paulette wanted to come back because this management guy from L.A. wanted the original four back together for a reunion. Warner Bros. got wind of it and said, ‘If you guys guarantee us 18 months, we’ll give you a nice chunk of money.’ I said, ‘nope, can’t do it.’ So that deal didn’t happen and Intersound signed them without me. Curtis and I had ownership so I leased them my half. It was basically a re-packaging of four new songs and all the stuff I was on, yet the credits ironically said that the guy who played on the four new songs played on the rest of the songs too. Two years later people were still booking the band and Curtis said, ‘Do you want to come back? Paulette’s gone again.’ I suggested we try another girl, so we did, and we made a cool record called Big Sky for Free Falls Records for Bob Freeze, who was one of the executives from Liberty. How did you meet Wynonna? In the golden Warner years, we toured with Randy Travis our first year, George Strait the second year and then with The Judds for a whole year in ‘89. Wy and I hit it off as buddies—we had a little spark. Naomi Judd was sick and getting ready to go to the Mayo Clinic, so on the last night of the tour I offered to go with them but Wy said, ‘No, I just have to take care of my mom.’ So I went back to L.A. Later, we’d see each other at award shows, but it would just be hello. When I moved here, I kept my horses at her place while I built fences. There was a long gap but in 2009, I’m playing at Puckett’s for these fun classic rock gigs andWy comes walking in with Naomi. So we got together and went on a couple of dates. When was your first gig back after the accident? Three months to the day that I got on the bus for our Christmas tour. We did 18 cities. It was later that we went back and played Deadwood, SD and I met the guy who saved my life. Did you need any special equipment to play with a prosthetic? For the first tours, I used two hi-hats in front of me, one tighter and one open and they had these clutches that had been designed that would open and close. But later we had to do a TV show where I’d show up and have to play someone else’s kit, so I eventually went back to playing normally. My head changed. I started hearing the whole song more clearly. When I’m in the studio playing drums, I don’t think about trying to get what I would have done before. I think about the sounds, I think sonically. I think, how do I make this feel great. I think more of the whole and less of the singular player. I played differently and I played better than ever did before, more musically. I stay inside the song more than just playing a drum part. How did end up producing Wynonna’s next album? Wy was doing another tour with her mother and they had this reality show on Oprah’s network. So the network suggested we write a song for Naomi and surprise her with it. I had discovered a group called The Henningsens. Worley and I re-united and started writing with them and recording them at my house. So Brian Henningsen, Wy and I wrote a song called ‘Love It Out Loud’ that we recorded for that show. Curb heard the song and I was given the keys, to go in and see what I could do, but it didn’t feel right because I wanted to make a record that didn’t care about country radio. Next thing you know, the label cleans house and the new regime comes in, including Jim Ed Norman–who I’d been with at Warner–I did my sales pitch to get out of the box of modern rockin’ country and make music that sounds like a woman who’s got some life experience. I don’t think everybody has to hear about spring break. So I stuck my producer balls on and said, ‘If I sink, I sink. But at least it’ll be on my terms.’ So that’s what we’ve done and that’s where we are now. Jim Ed told me that the best producer isn’t somebody who comes up with the best arrangements and parts, it’s the guy who spends the most time looking for songs. What’s the biggest challenge facing Wynonna, now? To re-introduce. It’s a lot easier to tell the artist’s story the first time, 30 years in. Granted you have a built-in audience but getting the business to allow that artist to be seen again is vastly challenging. Has producing Wynonna been an easy or challenging transition for the two of you? It’s been very easy, shockingly so. She’s a gem. She’s an amazing woman. Using time wisely is a big part of our marriage. What other projects have you been working on? I produced five or six songs for a soundtrack for a docu-drama about Afghanistan called The Hornet’s Nest. I wrote a song called ‘Follow Me’ which Wy and I got nominated for an Oscar and a Grammy. I acted in a film this year called Union Bound, and I’ve scored a lot of movies, which is a huge passion. The director of The Hornet’s Nest introduced me to the artist Pete Scobell and we used one of his songs for the movie’s closing credits. I’m recording Pete’s album as well and this week I’m in the midst of picking the last half of the songs. Also, we were asked to record a song for the movie American Sniper, coincidentally with Pete as well. That ended up being a duet with Wy and was perfect for the film except Clint Eastwood felt that point in the movie should be silence. It was the last scene, final funeral scene, so the song was taken out. We decided to release it as an iTunes single and it went to No. 1 without a major label which was incredible. What do you think are the biggest challenges facing our industry today? The age-old challenge is that you’ve got to accept that things change all the time. How do you play the game this month, as opposed to last month? And how do you make the money that is allowed, workable? You don’t have to spend beaucoup dollars. We all have to get paid and that’s a real hard thing. How do we make money elsewhere? Producing used to be a fat job. It’s now an hourly wage, unless you get a hold of a Taylor Swift or Luke Bryan or this new guy Hozier, who’s blowing up everywhere. You need to get one artist who is going to move product, because it can still happen. Otherwise, you have to figure out how to keep yourself employed. I love the concept of not having just radio, because part of my dark years were me thinking, there’s got to be another way to do this where I don’t have to wait for the phone to ring as a session player, for the cut to come in from the publisher, or scratch and claw and bite and beg for people to listen to my song. And that’s where I feel I’ve finally come to.